Challenge coins are growing increasingly popular in schools in Canada and the United States. This growing interest in such coins is largely due to the fact that school officials and teachers would like something more tangible to motivate students, and also show their pride and appreciation. Even President Obama has seen the potential in using challenge coins in school, as he used them to honor students at a high school in Virginia. Challenge coins have a long tradition in the United States military. They have been handed out to soldiers since the First World War. The coins were used as a way to create a sense of unity between service men and women. They are now being used, decades later, to promote the building of friendships and expression of pride between students in schools. By simply engraving the school mascot on to the face of the coin, teachers and administrators have a gift that they can share with students. These tokens can be kept as mementos by students, reminding them of their experiences and accomplishments during their time in school. A schoolteacher in Ontario is believed to have started the use of challenge coins in public schools in 2008. Not long after Medford and Boyer spoke, the coins were introduced in school, and students in Franklin Public Schools were filling their pockets with them. Similar to the military tradition, students were challenging one another to present their school coins. If a student couldn’t produce the coin upon request, they would have to do a push-up or give the person a candy bar. It became a fun way for students to interact, and teachers used the coins as a way to reward positive behavior. Since their introduction in Franklin Public Schools, challenge coins have made their way into schools in the United States, where they are now given to students as a token of honor. The President visited a high school in Virginia to give a speech to the student body on the first day of classes. The school’s student body president had the honor of introducing the President to his classmates. After the speech, The President shook the young man’s hand and then handed him a presidential challenge coin. The coin’s face had the number 44 on it signifying Barack Obama being the 44th president of the United States. The President’s use of the coin is another example of how challenge coins are beginning to become a symbol of honor for students. Whether it’s the President of United States or a public school teacher in Ontario, challenge coins are being given to students all over the world. They offer a fun way to show school pride, and are a tangible way to honor a special moment in a young person’s academic life. 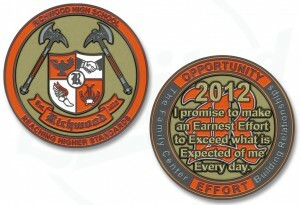 Challenge Coins Limited can easily come up with a design focused on representing your school. Browse our gallery for a few examples of coins we have minted previously. Challenge coins are now capable of being designed with different kinds of cutouts within the face of the actual coin. By adding these alterations to the typical coin, it is becoming a favorite choice among advertisers and challenge coin collectors. Thanks to the craftsmanship that goes into creating these coins, as well as their varied cuts and shapes, collectors and businesses have another great way to personalize their challenge coins. • The Bullet Hole Cut: This cut is used to enable the challenge coin to be attached to a chain or rope. Challenge coins can then be worn around the neck as jewelry, dangled from one’s pants, or even attached to a key chain. These new ways to display your challenge coins make them memorable, functional, and attractive. • Cut Around the Full Logo or Insignia: By cutting out patterns around a logo or insignia, an added charm is brought to customized challenge coins. This kind of cut also gives emphasis to the purpose of the coin by focusing the viewer’s eye on the design. This style of cut out challenge coins is perfect for businesses that wish to use them to increase brand or product recognition. • Rectangular, pentagon, triangle, square, oval, etc. Customized cut out challenge coins have brightened up the pot by adding so much more variety to the standard challenge coin. The cutting technique adds a new dimension, a new appeal, and a new feel to a classic collectors item and promotional tool. Businesses can order cut out challenge coins that are similar in shape to their logo or latest product. Athletic teams can have coins cut in a way that resembles a shape specific to their sport, such as equipment items and apparel. Organizations can use cut out challenge coins that are designed to commemorate a special cause or celebratory event, giving added meaning and collectability to the item. With so many different cut out coin options available to you, the most important question to ask before ordering should be as to how you would like to see your customized challenge coins designed. We encourage you to contact us today, and one of our representatives will work with you to decide on the perfect cut out challenge coins design for your order. Is your organization or business celebrating a grand opening this summer? If so, customized challenge coins are the perfect item to commemorate the ceremony. Organizations and business around the world have used the highly collectible commemorative coins to distribute to employees, and even customers as a means of signifying the importance of the event. At Challenge Coins Limited, we had the opportunity to design and make the challenge coin used to celebrate the grand opening of the Chino, California Police Department’s brand new facility. 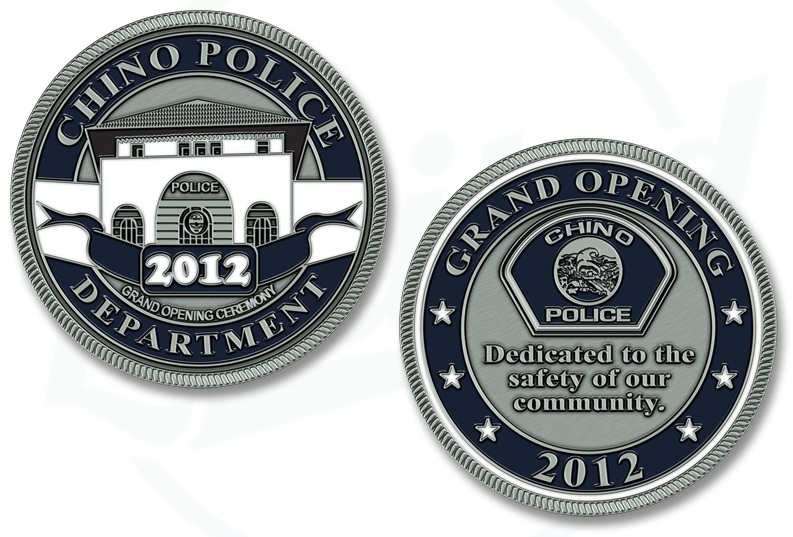 The coin features a signature blue, white and silver color scheme and the Chino Police logo, as well as text that identifies the meaning of the event. With the quote “Dedicated to the safety of our community, the coin not only celebrates the grand opening, but also recognizes the police department for the honorable job that they do for the city. The new facility is more than three and a half times larger than the old Chino Police Department building. At over 102,000 square feet, the new building will contain multiple interrogation rooms, a Class I detention area, and even a museum honoring the history of the city’s police force. It is also environmentally designed to reduce the amount of energy required during day-to-day operation. 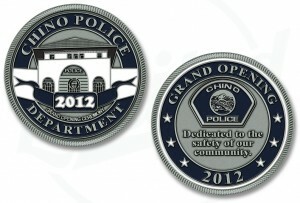 Using a challenge coin to commemorate the grand opening of the Chino, California Police Department made perfect sense. Since their inception, police challenge coins have historically been used to honor police departments and officials, as well as other public service and military organizations such as fire departments, the Air Force, and the Navy. With that being said, however, challenge coins are certainly not limited to the military and public service organizations. Because they are entirely customizable, they are also widely used by businesses to celebrate the grand opening of a new office building, retail store, hotel, or restaurant. •	The text/wording featured on the coin. •	The color scheme and finish of the coin. •	The images displayed on both the front and back of the coin. Challenge coins used to commemorate a grand opening of a building, be it an office or store, usually feature some kind of wording relevant to the special event. Both the date of the opening and the name of the organization or business are almost always included. Occasionally, as seen on the back of the Chino Police department example, a quote is included on such challenge coins to recognize the business or organization for the work they do. The color scheme and finish of the coin are often customized to match the colors of the organization or business’s logo. The colors chosen for use on challenge coins often add an element of branding and uniformity to the design. The images used on challenge coins for grand opening celebrations often depend on the type of business and organization. Logos are the most commonly used image for branding purposes, though many companies will also use some other picture that is relevant to their particular industry. If you would like to design and distribute a challenge coin to celebrate the grand opening of your business or organization, please feel free to give us a call at 1-800-818-3229, or visit the Challenge Coins Limited contact us page, and one of our representatives will be happy to assist you. Successful businesses are always looking for new and innovative ways to promote their brand name to the general public. In the case of South Dakota’s Firehouse Brewing Company, a challenge coin has proven to be one of the most effective promotional items that the company has used since opening more than twenty years ago. The Firehouse Brewing Company coin has been a very popular item among patrons, and is often kept as a souvenir and collector’s item. As is evident in the company name, the building that is home to Firehouse Brewing Company was not always a brewpub. For sixty years, from 1915 to 1975, the building was home to Rapid City, South Dakota’s firehouse. The building was converted into a restaurant in 1975, and remained that way until 1991 when it was bought out by a group of individuals that had bigger dreams for the building. The group stripped the building to its bare bones, leaving only the four layer brick and wood floor. In order to maintain the old-time feel of the restaurant, only polished brass and antique fire fighting equipment was used to adorn the walls and ceilings. Following its construction, Firehouse Brewing Company became South Dakota’s first brewpub. In the twenty plus years that it has now been open, it has established the reputation as being one of the best dining establishments in South Dakota. In order to commemorate its twentieth anniversary, Firehouse Brewing Company designed a challenge coin that it would distribute to its patrons and employees. The restaurant also had clothing and mugs designed to celebrate the event, though it was the challenge coins that had everybody talking. 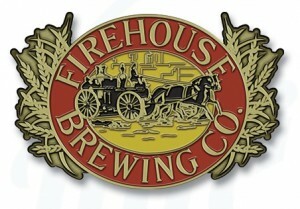 The Firehouse Brewing Company coin was an instant success due to its unique design, and display capabilities. For those visiting Rapid City to see the nearby Mount Rushmore, the Firehouse Brewing Company Challenge Coin makes for the ideal souvenir due to its portability. While challenge coins are predominantly associated with the military and political figures, their modification capabilities make them an excellent promotional item for brewpubs. Challenge coins can be customized to function as a bottle opener. That means that every time someone uses their challenge coin to open a bottle of brew, they’ll be reminded of the great tasting beer on tap at the brewpub. 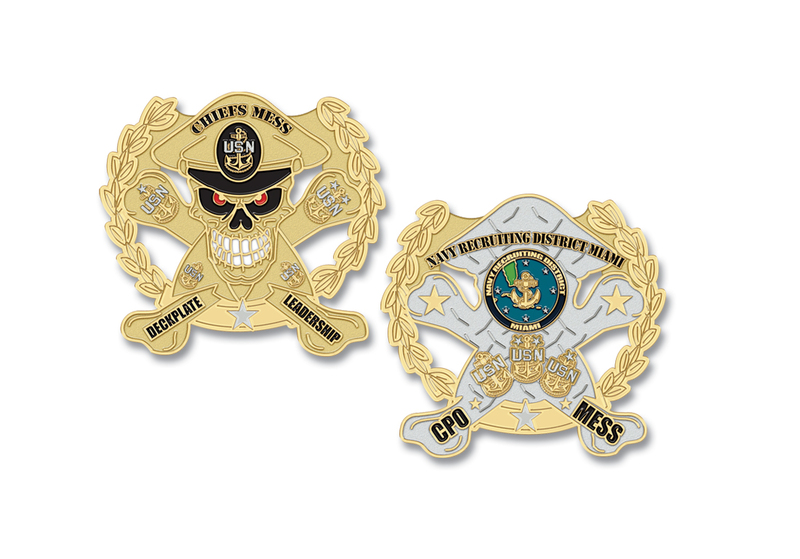 In addition to being customized to serve as a bottle opener, challenge coins can be designed to feature images, logos, and text when needed. In the case of the Firehouse Brewing Company coin, the brewpub could have chosen from a number of different visuals. From their twentieth anniversary logo to visuals that represent any of the popular beers available brewed at the Firehouse, the options were endless. If you would like to design challenge coins to promote your restaurant or brewpub, please feel free to fill out a free quote. 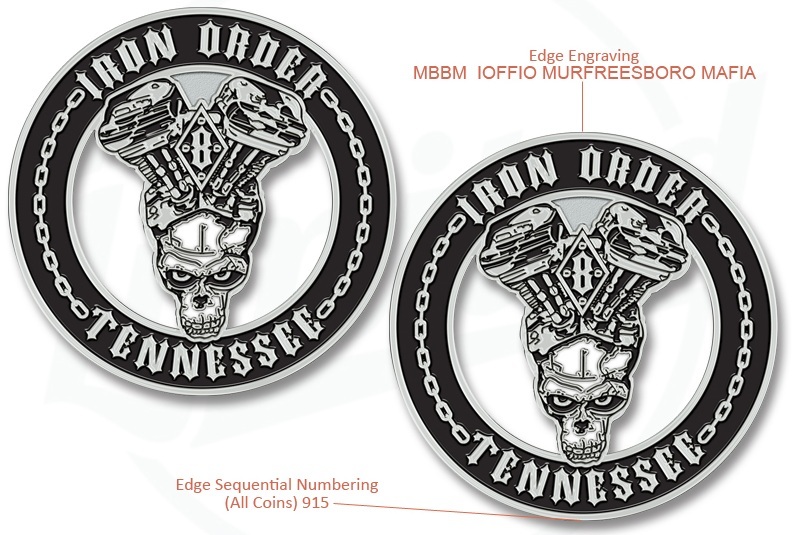 One of our representatives will contact you, and walk you through the process of designing and creating the perfect challenge coins for your dining establishment. How many times have you been given a business card only to stuff it in your pocket or throw it away without ever giving it a serious look? Odds are that has happened more often than not in your lifetime. The truth is that the majority of these outdated cards get lost in wallets or pockets, or they are simply discarded. A card’s design is often the determining factor in how effective it is in promoting a business. The more unique its appearance, the more likely it is to garner a second look. It is for that reason that many businesses are using such customizable items as challenge coins. While the overall appeal and uniqueness of challenge coins makes them highly effective marketing devices, they alone still do not guarantee optimal conversion rates. There is no way of knowing whether or not the recipient of the challenge coin is going to visit your website or further familiarize themselves with your product or service upon returning home or to their office. 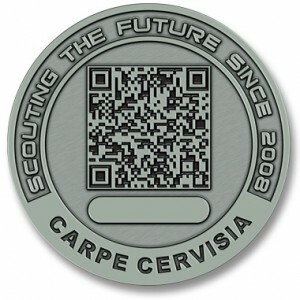 In order to improve conversion rates, companies are taking their use of challenge coins one step further by adding QR codes to their surface. QR codes, better known as quick response codes, are able to store large capacities of information that can be accessed in seconds. With the help of a basic application, potential clients can use their smart phones to access such data as hyperlinks, text, and even coupons that are stored in the QR code located on a coin. The QR code allows your clients to import your information to their smart phone without so much as a click of a button. Challenge coins featuring QR codes were first used at a conference in Las Vegas when a business owner sought a way to stand out from the rest of the crowd. He created a coin with a QR code that stored his company’s information, as well as his contact data and website. Not only did his challenge coins capture the attention of other attendees at the conference, but also the QR code design enabled him to immediately identify interested customers and start the negotiation process. With a standard card, you may have to wait days or even weeks to hear back from a client. In fact, your card may get lost among the countless others that potential client received during the same event. He or she may also have simply forgot about the deal or business proposition that the two of you had discussed. By using challenge coins that feature a QR code with your contact information and any relevant company data, you can be sure that they will not get lost among the common forms of media given out by your competitors. Even more importantly, your potential client can use their smart phone to immediately access any details that may be influential in closing the deal. With all the details they will need right at their finger tips, your potential client will be far more likely to move forward with a transaction. The details of your deal will be fresh in their mind, and because everything is there for them in the QR code, they’ll likely contact you first when it comes time to finalize everything. The combination of the unique look and shape of the challenge coin, and the readily available information in the QR code provides for better conversion rates than you would likely see with other traditional advertising. As such, challenge coins featuring QR codes are the perfect option to supplement the standard business card as a means of effectively advertising and promoting your business. Much like the military, unity is absolutely essential to the success of any sports team. At both the collegiate and professional levels of sports, team unity could be the make or break factor that decides whether a team has what it takes to win a championship. With that said, it should come as no surprise that both collegiate and professional teams are looking to challenge coins to inspire their athletes and promote the idea of team building. Challenge coins have long been used by the military with the intentions of boosting camaraderie among the troops, and also honoring those that performed an act worthy of recognition. Their history has been well documented, and there are countless success stories that give evidence of their effectiveness in increasing morale. The world of professional sports has taken notice of the impact that challenge coins have had in the military. Teams are looking for ways to use customized coins in their organizations to encourage performance improvement. One professional sports team that has made use of coins is the National Hockey League’s 2011 Stanley Cup Champion Boston Bruins. After Boston Bruins defenseman Andrew Ference received a Ranger challenge coin from a friend in the Army, he realized that his team could use similar customized coins for bonding purposes. In coordination with team officials, Ference created Boston Bruins challenge coins for each of his teammates. The challenge coins feature the Boston Bruins logo and the words “Old Time Hockey” and “Since 1924” along the front edges. On the backside, the coins feature the city of Boston’s seal and the jersey number of each teammate. Similar to the military tradition, there are informal rules related to when a teammate can earn their own challenge coin. For example, rookies must wait to get their challenge coins until they have completed various team-oriented tasks. Professional sports teams are not the only ones using challenge coins in athletics. Many collegiate teams are using them to encourage unity among the older and younger members of the team. Local teams involved in youth sports are also finding ways to use customized coins. Coaches of youth teams use the coins to reward unselfish play, and excellent sportsmanship. The custom coins are used to promote team play, as well as to encourage strong practice habits. For some, such coins give individuals and teams a goal for which they can strive. For others, it provides for a bonding experience between the team that may not have seemed feasible through other manners. And finally, some youth leagues use baseball challenge coins for trading amongst each other at tournaments. Although customized coins used for sports don’t hold the exact significance as those used by most military officials, they are very similar in nature. Those that hold the coin represent the organization in every action and statement that they make. As such, the challenge coin serves as a reminder to work hard, and to value teammates. If you are thinking about ordering challenge coins for your sports team, you’ll be able to find the information you need by visiting the Challenge Coins Limited website. The race for NASCAR challenge coins is on. Professional NASCAR drivers now distribute these popular customized coins to fans and friends. Originally American soldiers collected and traded these coins, but now superstar race car drivers like Jeff Gordon have a special coin they give to commemorate victories and share with fans and children. Number 24 is one of NASCAR’s most respected and accomplished racers. He has won four series championships, has placed first in three Daytona 500s, and has the third most wins in the sport’s history. To show his appreciation for his fans, Gordon gives out challenge coins to celebrate his biggest accomplishments. In honor of his 400 wins at Indianapolis Motor Speedway, he had a challenge coin designed and distributed. Gordon loves to give back to those less fortunate. That’s why he has a special challenge coin for the sick children he visits. As the founder of the Jeff Gordon Children’s Hospital, Gordon spends time with kids who are stricken with cancer and other life threatening diseases. Gordon decided he wanted to give them something more meaningful than just another signed baseball cap, so he now gives this unique coin to children he meets. These tokens mean a great deal to the children. In one case, a parent buried their child with the coin, because it meant so much to them. Other NASCAR teams who sell the coins are Joe Gibbs Racing, Hendrick Motor Sports, Roush Racing, International Speedway Corp, and Dale Earnhardt Inc. All of these race car drivers offer their challenge coins at concession stands during any big race, sports memorabilia shops, and online websites. In fact, some of them are beginning to team up with companies outside of NASCAR and create limited edition collections. The families who have driven in NASCAR are too many to count, but what a great way to commemorate all they have done for the sport than creating these limited edition challenge coins. The popularity of the coins indicates that challenge coins are here to stay in the fastest sport on four wheels. NASCAR and challenge coins are a perfect match. Both have a long tradition in American culture, and both provide amusement and joy for enthusiasts. NASCAR fans look for memorabilia to celebrate their favorite driver’s victories and career, so what better way than with a customized challenge coin. They can be designed for any occasion, so you don’t have to wait until you get tickets to the big race to purchase them. If you’re interested in getting a coin made to get your fans or members all excited, contact us via the web or phone to talk more about your ideas.